What’s It Like To Drive An EV? Become A SEVA Member Today! The number of electric vehicles registered in the State of Washington continues to grow! Washington State has a number of incentives for electric vehicles thanks to forward-thinking legislators and the work of many SEVA members such as Jeff Finn who is pictured here charging his LEAF in front of the Capitol, Pictured with him is SEVA President Stephen Johnsen. Washington State is a great place for taking an electric vehicle road-trip. The Department of Transportation has been strategically placing many DC Quick Charge stations along the states major highways. Gov. Inslee signs Washington State “de-ICEing bill” (RCW 46.08.185) in 2014 requiring that EV charging stations are clearly identified with signs and striping. Gasoline cars parked in EV slots will be fined $124. 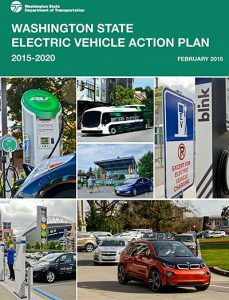 Would you like to add your voice to support transportation electrification in Washington State? Would you like to receive alerts on Electric Vehicle related legislation in this upcoming session? Thank you for helping advance the adoption of Electric Vehicles in Washington! Reducing emissions by making changes to the clean car standards and clean car program. No Action Taken This Session. Needs more feedback from constituents. As of April 14, 2019, bill is stuck in the Ways and Means Committee. Concerning transportation funding.Sponsors: Hobbs, Saldaña, Sheldon, Cleveland, Randall, Palumbo, Takko, Nguyen, Mullet, Liias, Lovelett, ConwayThis bill would double the registration tax on EV’s to $300 per anum. Concerning additive transportation funding and appropriations. This bill would double the registration tax on EV’s to $300 per anum. As of April 14, 2019, bill is in Senate Rules Committee. To research any of these bills in detail, please visit the Washington State Legislature. SEVA response to “Phony Math and Ironic Economics Used to Justify Electric Car Tax Breaks” article about the carbon emission savings page prepared by SEVA for the proposed extension to the Washington State electric vehicle sales tax exemption. These are the legislative items SEVA focused on in 2015. Here’s a complete list of all legislative items SEVA has supported over the years. The Seattle Electric Vehicle Association is a non-profit, all volunteer association of electric vehicle owners and enthusiasts. Our mission is to promote, the widespread adoption of electric vehicle through education, demonstration and advocacy. SEVA is a registered 501(c) 3a and all donations are tax-deductible. SEVA meets the 2nd Tuesdays of every month at the Church of the Nazarene, 4401 2nd Ave NE Seattle, 98105. Meetings are free and open to the public. We welcome *anyone* who has an interest in electric vehicles: you do NOT have to own one! Find meeting time and location here. An informative video that details the energy efficiency between hydrogen fuel cells and battery powered vehicles. Copyright © 2019 Seattle Electric Vehicle Assocation (SEVA). All rights reserved.